A few weeks ago, Dorothy and Duke West invited me into their home to see their lovely and skillful fall decorations. While I was there, they told me that their decorating specialty would actually come a few weeks later, when they would put together an outrageous party display for Halloween. I was excited when they invited me to come see their finished product yesterday. They weren’t exaggerating. Their Halloween decorations are completely amazing. Almost every surface of the main living areas of their home is covered in fabulously horrifying details. It’s a visual treat inside and out. I love learning about people with the talent and creativity to put together a grand project like this. Dorothy and Duke live in a townhouse in Whisperwood Cluster in South Reston. As I arrived yesterday, they were adding the finishing touches to their outdoor decorations. 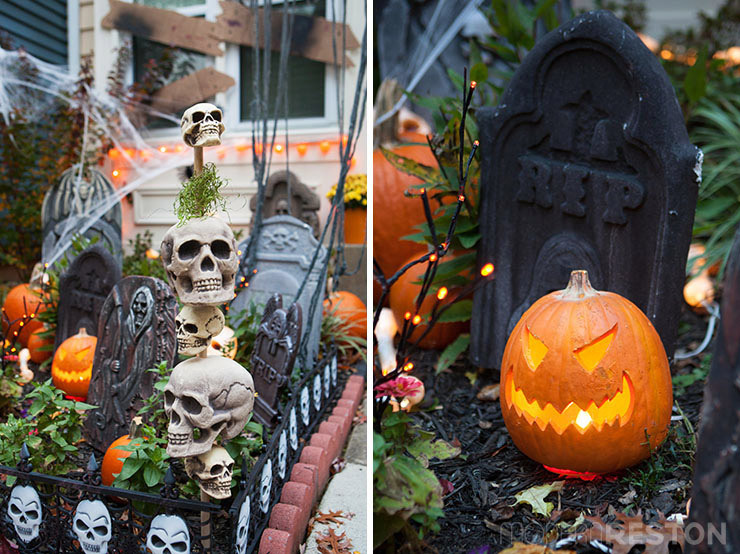 Their front yard is layered in creepy gravestones, spiders, and skulls. Dorothy explained that she has always loved Halloween, and her very first memory is from the Halloween when she was a three-year-old Care Bear. When she was a kid in upstate New York, her family and neighbors decorated their front porches for trick-or-treaters. When she eventually moved to Florida several years ago, she was dismayed that few of the houses in their community decorated for Halloween. She decided to begin collecting decorations and start a new tradition in their neighborhood. 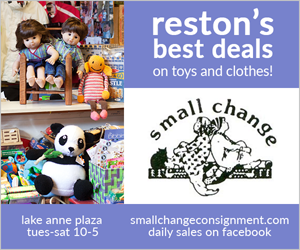 Dorothy and Duke have since relocated to Reston and carried on their traditions here. Their collection has grown over the years, and their house must be a highlight of their young neighbors’ trick or treating adventures. “I love to see the reactions on the kids’ faces when they come to our house,” Dorothy said. 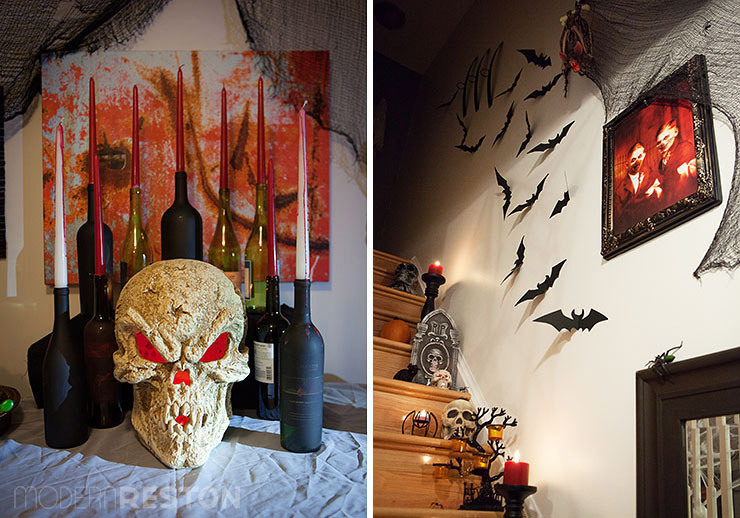 They also love to entertain; they host elaborate Halloween parties for their friends. Dorothy used to work as an event planner in Florida, so she has a knack for party preparations. 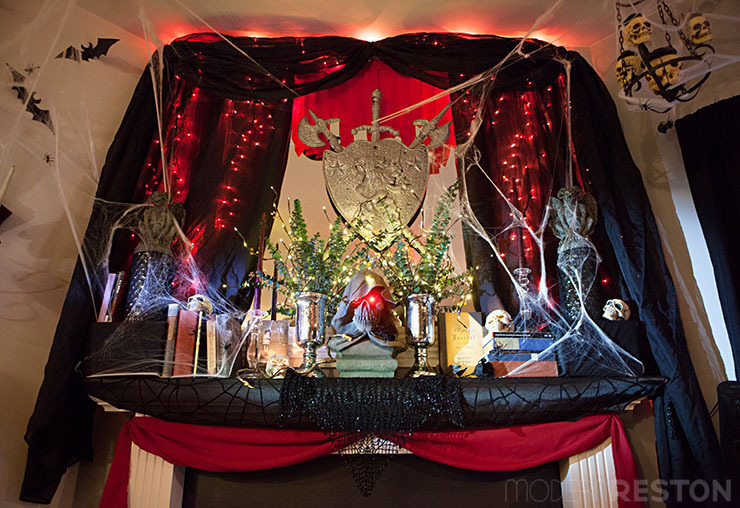 Their collection of decor has grown over the seven years they’ve been doing these parties – Dorothy says that as their reputation as Halloween hosts has developed, their friends have given them lots of decorations as gifts. Duke gives Dorothy most of the credit for the decorations, but he enthusiastically embraces the project. 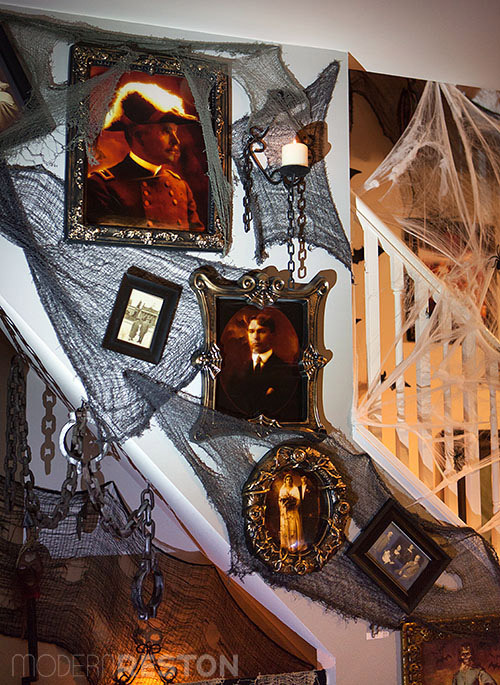 His mother also loved decorating for Halloween when he was a child, so perhaps it’s in his blood, too. He particularly enjoys putting together mechanical decorations that jump out at people when they least expect it. Their friends should expect a few surprises at that party! Inside the house is a seemingly endless number of spooky details arranged in thoughtful vignettes. I could have spent hours there, examining each detail. 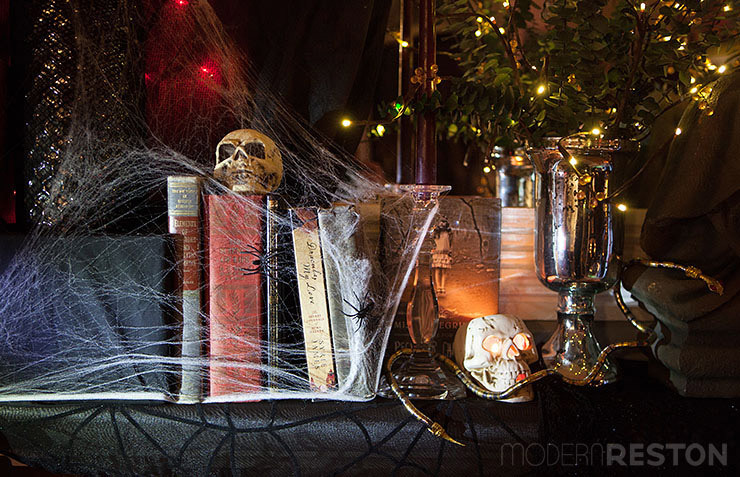 They have even chosen book titles with mysterious titles or creepy cover images to display among their decor. 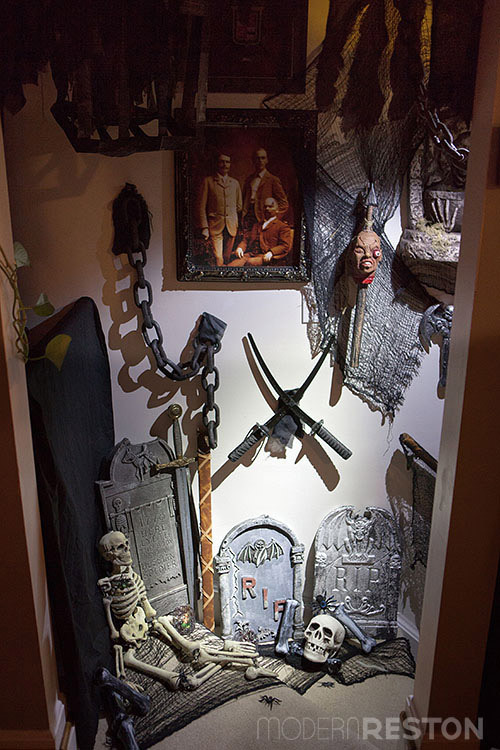 Dorothy arranged the decorations into themed areas, to give the feel of different rooms in a haunted house. The stairs to the basement are arranged as a dungeon. 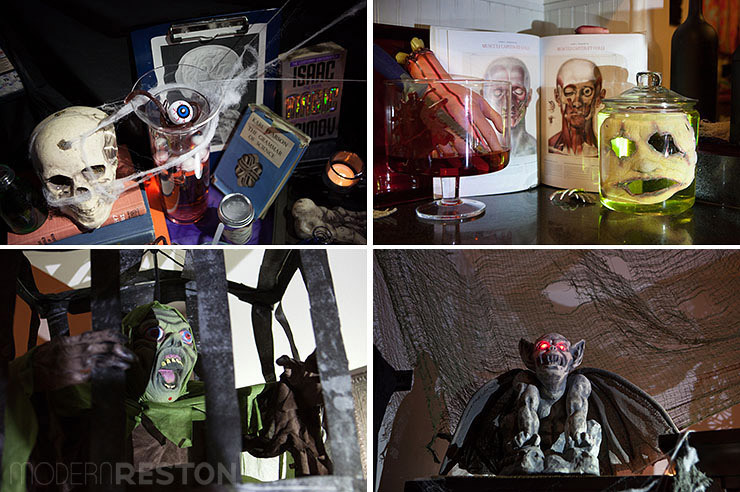 A large area in the living room is their laboratory, with tons of science-themed scary details, including vials, poisons, scalpels, and dismembered body parts. One of my favorite parts of their decorations is also Dorothy’s favorite. She has created a photo gallery wall of holographic images that move as you look at them. The effect reminds me of the paintings of Hogwarts, only creepier. It’s a subtle but powerful effect! The dining room centerpiece is a skull with glowing eyes that change colors gradually. It’s surrounded by wine bottles that Dorothy has painted black. Several paper bats swarm around the room. They are made of black cardstock that Dorothy cut out, folded in half, and attached to the wall. She recommends this project as a great one for children. 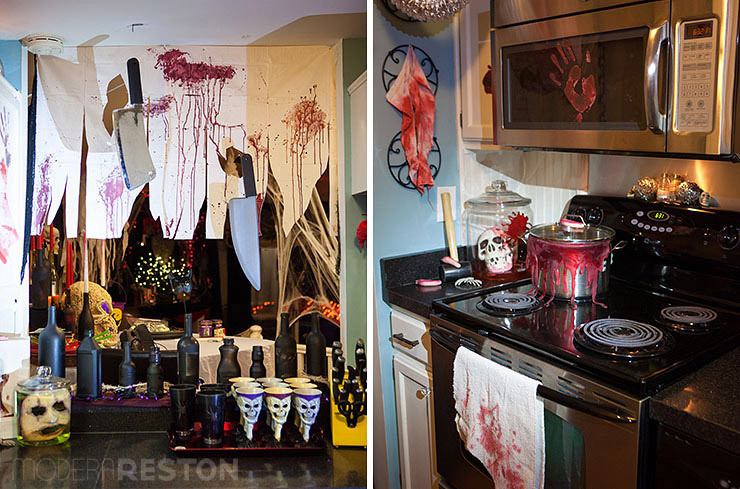 The kitchen had been transformed into a horrifying butcher shop. 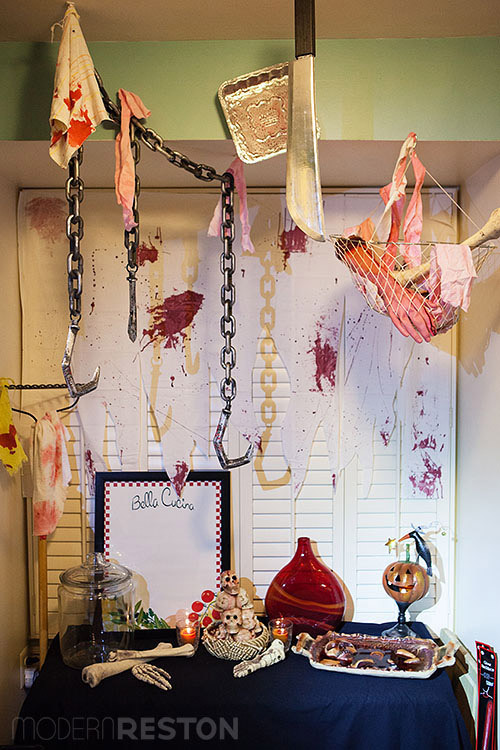 Bloody fabric, body parts, and (fake) knives filled the kitchen. I particularly liked the pot that was bubbling over with blood. The big question I had to ask: How long did it take to put all this together? The answer is three weeks. They worked on it throughout most of October, and they still had tons of ideas for things they’d like to add. What a fun couple with fabulously creative energy! Thank you very much, Dorothy and Duke, for inviting us all back to your home for another phenomenal holiday home tour. 1. Include normal household items in your decorations. Not everything needs to be bought or made from scratch. The Wests include cooking pans, vases, glass containers, dishes, and candles throughout their displays. “Candles make everything creepier,” Dorothy says. 2. 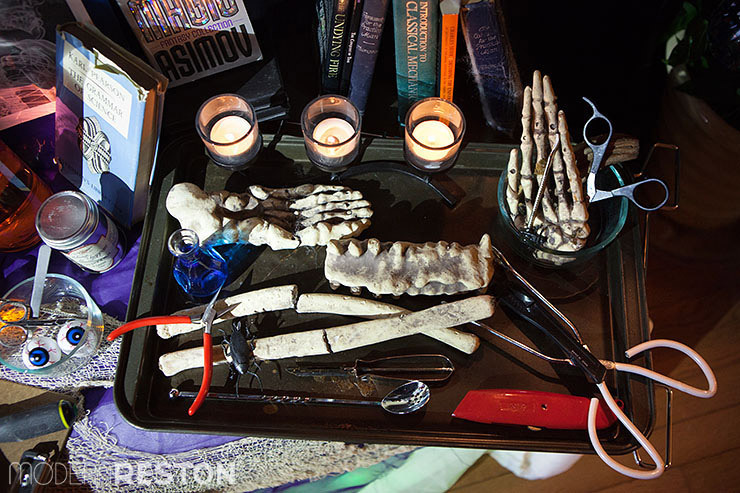 Display books with creepy titles as props. Choose books that look old and have interesting binding. 3. Use removable picture hooks to attach items to the wall or ceiling. Dorothy recommends hooks by 3M that use removable adhesive and don’t damage walls. 4. Use fishing line as invisible string for hanging items. 5. Include plenty of fabric, particularly fabric scraps. Drape it on tables, mantels, and walls. Rip it into long shreds and hang them in doorways. Add fake blood if you like. 6. Hide Christmas lights under tablecloths to make tables glow. They had covered a bench with gauzy fabric and placed yellowish-green lights on the floor underneath. 7. Use a fog machine inside the house, and let the fog spill out the front door when you greet trick-or-treaters. Duke recommends that people make their own fog machines if they don’t want to buy them. You can find a tutorial on Popular Mechanics. 8. Don’t overlook small touches. Place little details like plastic spiders on the walls, tables, and edges of floors. Spiders are carefully dispersed throughout the Wests’ home, along with several spider webs. 9. Look for ideas at websites like Pinterest if you think you aren’t creative. But don’t doubt your own imagination. “I think everyone is creative in their own way,” says Dorothy. 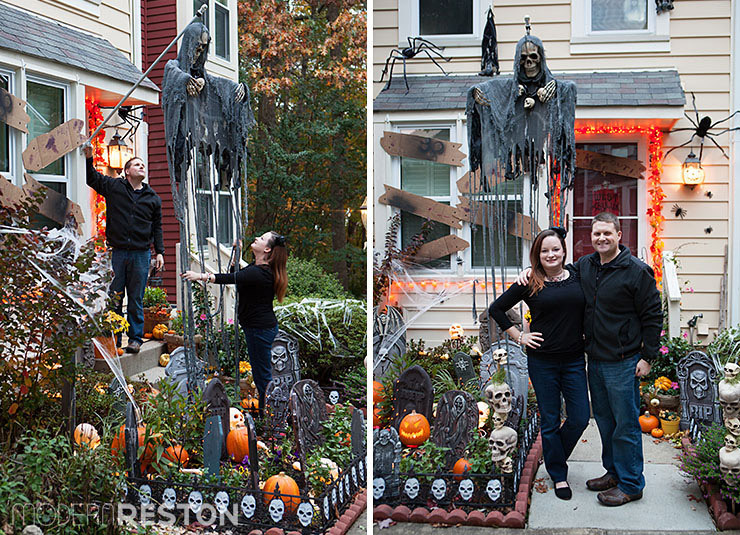 Who else has excellent Halloween decorations in the Reston area? 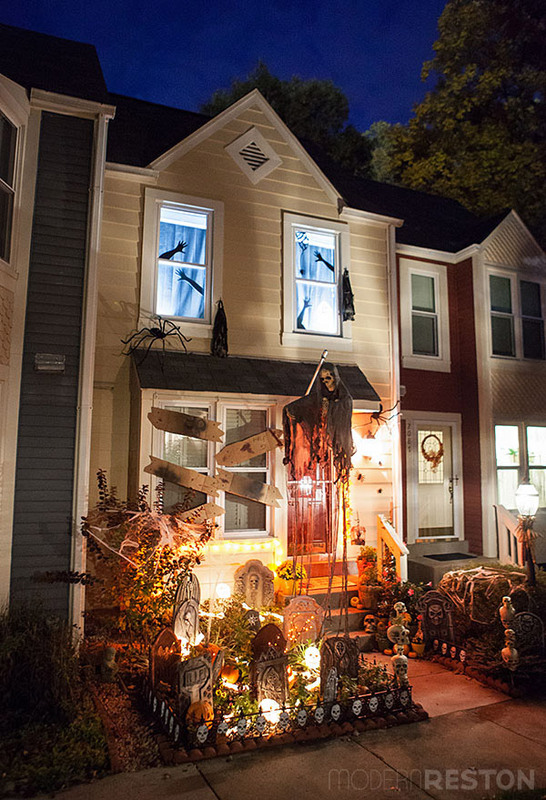 Please let us know if you see some great displays as you go door-to-door on Halloween night. Be safe out there, and have fun! If you love seeing how people decorate their houses as much as I do, don’t miss our archive of home tours. For more Halloween horrors, check out my review of Markoff’s Haunted Forest. Wow! Just wow! Stunning and the attention to detail is amazing!